Camps For Kids works to assure that no Kansas City area child will be turned away from summer camp because of low income, or physical or developmental disabilities. 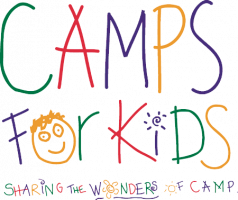 Camps For Kids was founded in 1981 by Marjorie Powell Allen and other community leaders, who appreciated the positive values of summer camp and wished to extend those values to children in need. Camps For Kids solicits funds from foundations, corporations, and individuals. These funds are used to match camp-dedicated funds that arrive between April 1 and July 31 each year. An overnight experience to benefit special needs children. © 2018 - 2019 Camps For Kids. All Rights Reserved.